Chaweng is definitely where the action is full-on. The Green Mango is where the MTV party beat thumps into the early hours and the Reggae Pub pulls a good crowd every night. These are the two top nightclubs on Koh Samui, both are centrally located within all the other action in Chaweng and both are within crawling distance of Nid's Bungalows (if you finally decide to come home). All around Chaweng you'll hear the sounds of soul, reggae, hip hop, metal and rock (and some more.) From classy air-conditioned places with imported DJ's and loud, loud, sound systems, to outdoor venues featuring live Thai and foreign bands. If you need to chill out, before hitting the beach parties, try beachside dining. There are many restaurants with excellent food and beach mats to laze on in the balmy evenings. From sophisticated gourmet restaurants to the famous full moon parties, Koh Samui has some of the best nightlife in Thailand. Discos, clubs, music venues, beer bars, classical Thai dancing, mud wrestling and even Thai lady boxing!! A relatively new addition to the nightlife scene, Surat Thani's half moon parties seem to have been started in response to the demise of Samui's own Rocky Bay beach parties (due to an increase in luxury property development in the Choeng Mon area). Saying that though, the Half Moon people go to great lengths to offer an attractive package to counterbalance the longish trip over to the mainland and provide a viable alternative to the Full Moon Party. For around 1,800 Baht, revellers can be collected from their hotel, transferred by coach and ferry to mainland Surat Thani, then whisked off to a secluded beach for an all-inclusive night of fun and games. A generous seafood barbecue and all the alcohol you can drink are thrown in alongside, of course, a night of house and techno courtesy of local and international DJ's. The price also includes the trip back to Samui the next day. For a little extra there are onsite bungalows available for anyone who can't last the night. For more info visit Travel Solutions, next to the Ark Bar, North Chaweng, or call Toto on +66 77 210 198. With the steady development of Koh Phan Ngan as an exclusive enclave for super wealthy tourists, the legendary Full Moon Party on Haad Rin Beach could soon be a thing of the past. However, before that day arrives, ragers everywhere still flock to the world's biggest beach party every month. The music from the multiple sound systems nearly splits the island apart and there's dancing 'til dawn on party nights. Not to everyone's taste certainly, but it's definitely a unique experience within the gentle Thai culture. To get there from Nid's Bungalows, enquire at our travel desk for tickets on the high speed Lomprayah catamaran, or for transfers to Bangrak Pier or Fisherman's Village, Bophut from where ferries and faster craft depart on a regular basis. Although justly famous for its Full Moon Parties, Koh Pha Ngan has a lot more to offer visitors than just all night dancing. 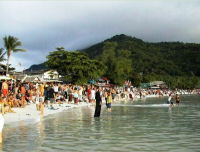 There are few day trip options from Koh Samui, apart from sailing cruises, so at least an overnight stay is recommended. Koh Pha Ngan is at least ten years behind Samui in terms of development, which lends the island a lot of charm, and some would say it's more picturesque than Samui itself. The main tourist beach, Haad Rin, is busiest on Full Moon nights, but is well worth a visit the rest of the month too for its chaotic jumble of bars, clubs, restaurants and handicraft shops. The locals - expats and Thai's alike - are a friendly bunch and help make the atmosphere a lot more laid back than frenetic Chaweng. Their attitude is that every night is a party night on Haad Rin, which pretty much sums it up. The main selling point for the rest of the island is pristine undeveloped beaches, with only a handful of bungalows to disturb the peace. The most upmarket of these is Tong Naipan, thanks to the presence of the island's most luxurious resort, Panviman. Haad Tien is very shallow and pebbly, but is home to the Sanctuary Spa and Wellness Centre. This offers a range of fasting, yoga and treatment packages and has an excellent vegetarian restaurant.